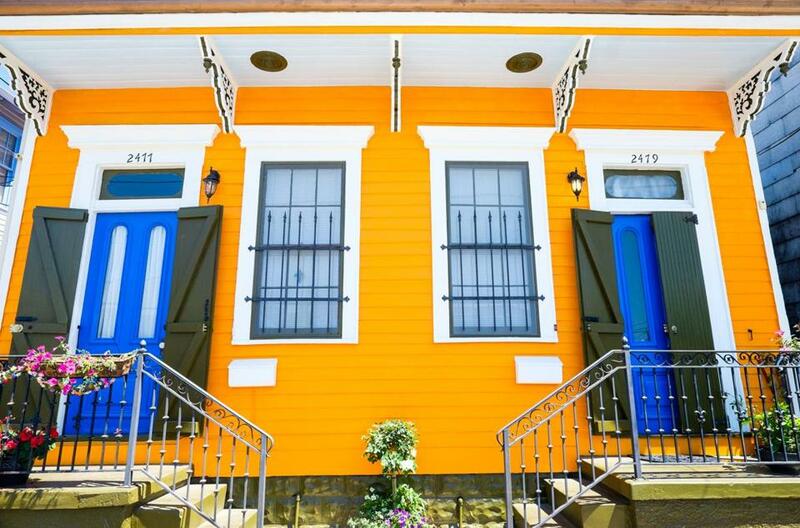 NEW ORLEANS — There are only so many hurricanes and beignets you can swallow. My husband and I have had a love affair with New Orleans for more than two decades, visiting every chance we get, but we’ve been done with Bourbon Street and the usual tourist stuff for years. Now when we visit, we check out different neighborhoods off the beaten path, and on one of our recent trips we spotted someone kayaking in a bayou, a first for us. We didn’t have time to try it out then, but we added that to our standing to-do list for a future visit. This year, completely dispirited by winter in Boston like most everyone else, we fled to the Big Easy in March for a few days, and set out to spend as much time as possible outdoors in what we felt was gloriously temperate weather (65 to locals is cold; to us, it was balmy). It turns out there’s tons to enjoy outside that doesn’t involve a “go” cup (though I’m not knocking that!). Various outfitters ply the waters of Bayou St. John, which is easily accessible by streetcar from the center of the French Quarter, offering everything from paddleboarding to kayaking. As first-timers on the bayou, we opted for a guided tour with Kayak-Iti-Yat, a small, two-person operation run by a local couple. We also decided to try something new, paddleboarding, which I had wanted to attempt for a while. The flat, calm surface of the bayou, with no motorized boats or really much traffic at all, seemed like an ideal place to learn. NOLA Paddleboards operates from the same spot on the bayou as the kayak company. Owner Jeff Lakey offers one-hour lessons and paddleboard rentals, and if you can focus on anything other than not falling off your board, he’ll talk about the history of the area. We did OK — at least we didn’t fall in — but I was more concerned with balancing than anything else. Lakey also offers lessons on Lake Pontchartrain, where he became the first person to stand-up paddle 26 miles across it. He did it for a fund-raiser. On the two-hour Big Easy Bayou Tour with Kayak-Iti-Yat, an easy paddle through the neighborhoods of Bayou St. John, I could actually pay attention to owner and guide Sara Howard as she talked about the area, describing how the bayou was once a major thoroughfare for Native Americans and later for 18th-century settlers. While it’s still in the city, it has more of a suburban feel these days. Since my husband had been missing his daily bike rides to work, and is a huge fan of “Treme” (the HBO series set in New Orleans), we signed up to take a three-hour Creole & Crescent bike tour with Free Wheelin’ Bike Tours, which goes through that neighborhood. My husband especially liked the fact that the family-operated, locally owned business custom-assembles its bikes and uses US-made parts. Our guide took our small group (a doctor from Tunisia, a college student on break, and us) through the Bywater and Marigny neighborhoods (a Marigny house pictured above), down Esplanade Avenue, with its ancient oaks and elegant 19th-century homes on either side, into and through Saint Louis Cemetery #3, over Bayou St. John, and into City Park, where we took a break before heading through Treme, then back to the bike shop. Along the way she spoke about the sights and the culture of the city. When we found ourselves back on our own two feet, we decided to further explore City Park, which is home to myriad attractions, including the New Orleans Museum of Art, the New Orleans Botanical Garden, an amusement park, golf courses, tennis courts, and plenty of walking and jogging paths. The park proudly boasts that it has the largest grove of mature live oaks in the world, including one that’s almost 800 years old. Also within its 1,300 acres is the 60-acre Couterie Forest, a haven for birds (and birders). On our informal exploration, we saw not only a variety of birds, but also alligators and turtles. Informational signs along the paths can help you identify what you spot, and for even more depth, check with the Botanical Garden, which offers guided bird walks. 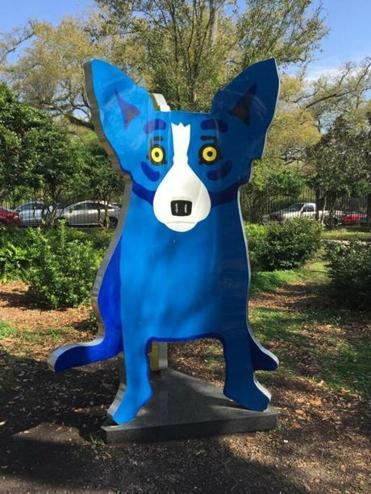 The Besthoff Sculpture Garden, adjacent to the Museum of Art, is a lovely five-acre park filled with more than 60 sculptures (including the blue dog pictured) set among live oaks, a lagoon, and plenty of shade, making it the perfect place to rest awhile. As usual, when we left New Orleans, we felt like we’d barely scratched the surface of its charms. But we know we’ll be back. There’s always something new to discover, even if it’s something that’s been there the whole time.